Even with rising education levels many countries continue to grapple with a dual employment problem of how to skill youth and how to ensure those skills match industry demand for jobs. The jobs-skills mismatch has turned the spotlight on governments adapting their education and training systems to cope with changing market forces. Enterprises too find themselves on the back foot as they try to keep pace but face severe skill shortages among youth. The Initiative consists of Ten Actions to boost the quality, quantity, and diversity of apprenticeships. 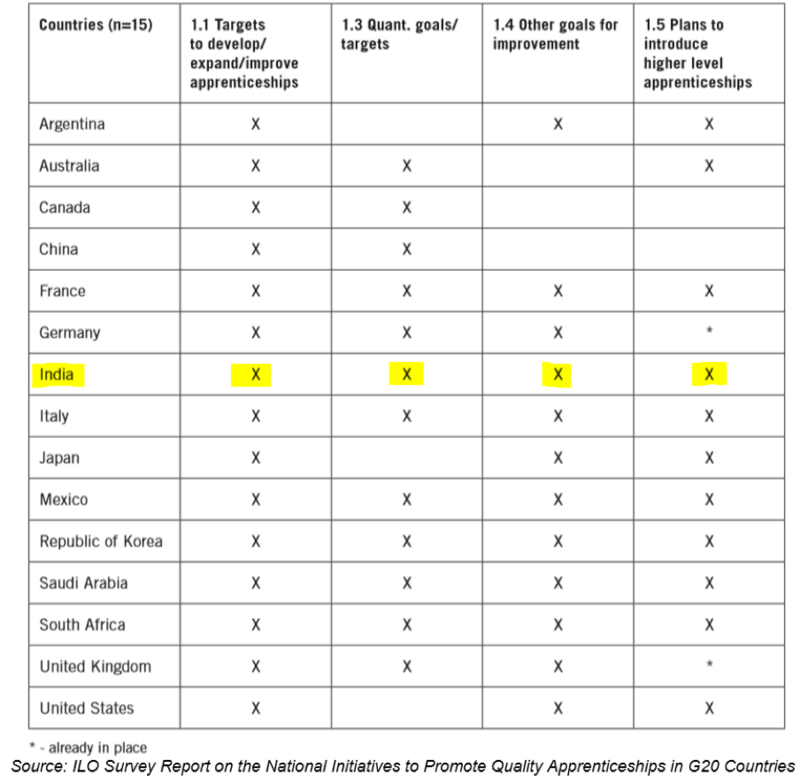 We discuss key findings of the ‘ILO Survey Report on National Initiatives to Promote Quality Apprenticeships in G20 Countries’[i] which spawned from the Skills that Work Project. In Part I, we look at key findings and good practice on the first 5 of the 10 Action Points, from a survey of 15 influential governments of the G20. From India, responses were provided by the Ministry of Skill Development and Entrepreneurship (MSDE). We delve specifically into findings from the Indian context. All countries who responded to the survey are actively engaged in boosting apprenticeship opportunities including the quality of skills acquired through apprenticeships. National targets have been set to promote quality apprenticeships with a majority of countries with plans to integrate apprenticeships with higher education, if not already done. As we know, India’s goalpost to place 50 lakh youth in apprenticeships by 2020 was promulgated by the National Apprenticeship Promotion Scheme (NAPS) launched in 2016 to infuse new energy into apprenticeships as a win-win model for both industry and youth towards building a large skills-based workforce. However, as of January 2017, a mere 1.43 lakh youth had registered under the NAPS[ii] and at best there are 3 lakh apprentices in the country under various public and private models. India has its work cut out to boost its apprenticeship numbers. Of the 71 million enterprises, a paltry 50,000 of them engage with apprenticeships. Coming back to the survey, in response to a question on non-quantitative goals to strengthen apprenticeships, the MSDE cited revamping the curricula for all apprenticeship courses with 63 of 258 completed at the time of the survey. We feel this is imperative, and needs action with much more gusto given the severe jobs-skills mismatch where it is estimated that a whopping 65-75% of youth entering the Indian workforce are either not job ready or are unemployable. The survey found that a majority of governments seek to strengthen the involvement of social partners (workers’ and employers’ organisations) in recognition of their vital role in the design and delivery of apprenticeship training. In the first component of Action 2, using a 5-point scale, responses were gathered for 6 different activities and how involved social partners were. For each of the 6 activities above, the MSDE reported active involvement of employers (in national/state apprenticeship boards) but chose not to respond on the level of involvement of employee organisations. 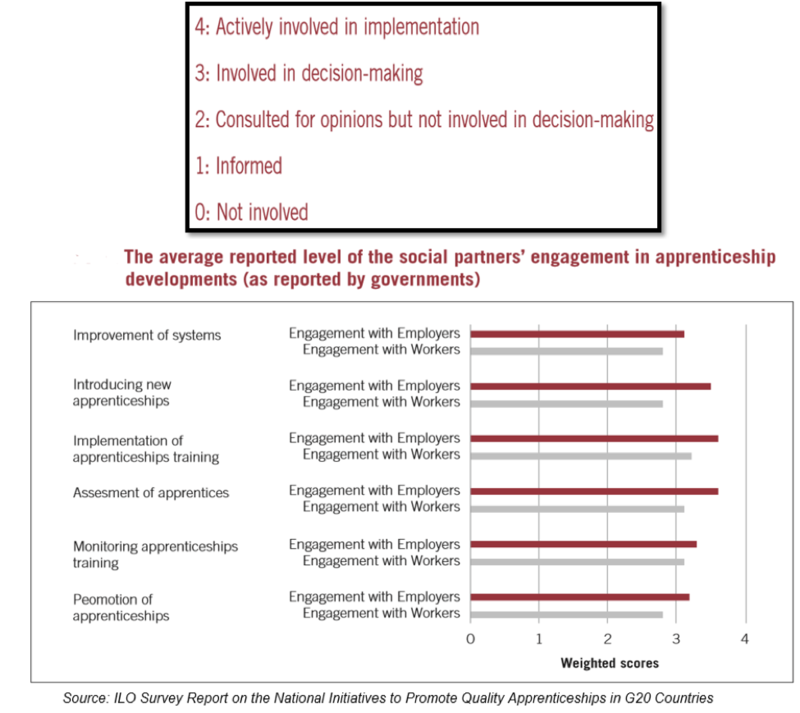 Overall, countries reported more involvement of employers in decision making processes in apprenticeship systems (an average score of 3+) with trade unions involved moderately during the consultation stage (a score of 2-3). The second component of Action 2 asked about specific initiatives to improve the quality of workplace training in apprenticeships. The report does not specify if India responded to this question. Germany is highlighted as a front-runner in starting multiple targeted initiatives to enhance the quality of on-the-job training in apprenticeships. The MSDE did not respond to questions pertaining to career guidance through employment services and online portals. It gave a response in the positive about career counseling by staff in TVET schools and centres. No response was registered for the MSDE on the availability of part-time apprenticeships as part of upper secondary schooling. To the best of our knowledge such a provision does not exist in the current Indian schooling system. Australia on the other hand stands out as a country with a high level of school-based part-time apprenticeship opportunities. In response to apprenticeships being part of the formal education system, the MSDE responded ‘yes’ to certification of apprenticeship being an educational credential but did not respond to an apprenticeship certification being a stand-alone formal credential or a combination of both. This points to further work needed to bring national recognition to apprenticeships by integrating apprenticeships with formal schooling. 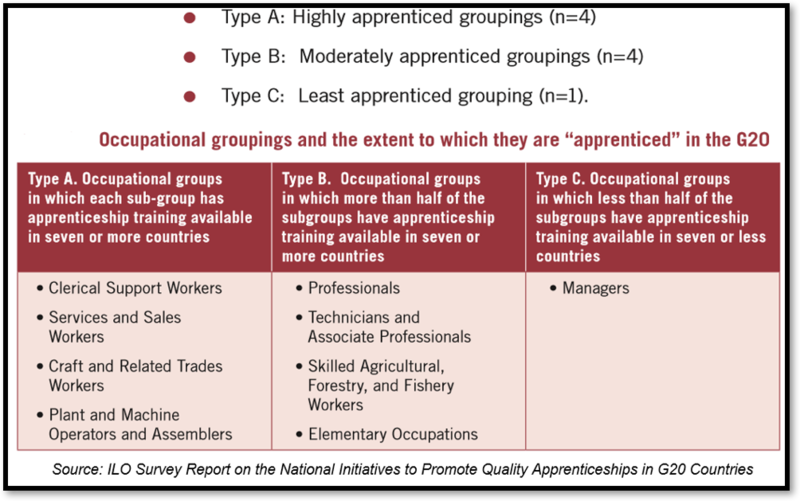 There is vast variance in occupational coverage of apprenticeships among countries. Some job roles such as sales exectuives and machine operators are more apprenticeship-based than others. Most countries cited intention to expand the reach of apprenticeships, especially those facing skill shortages. Some governments are also using apprenticeships to address new job roles in the face of Industry 4.0. To the questions on expanding occupations for apprenticeships and promoting apprenticeships to address skill shortages, the MSDE answered ‘yes’ to both. As we have noted in other articles, a key amendment to the Apprentice Act (1961) in 2014 was the tabling of a new category called ‘optional trades’- employer led and demand based, shifting flexibility to employers to design and customise apprenticeship training in any trade or occupation to suit their business needs. This is to bring SMEs into the fold of apprenticeships given their economic importance. To the question on how countries fostered the engagement of SMEs in apprenticeships, the MSDE cited the NAPS and its financial incentives for employers, and the role of State Apprenticeship Advisors in hand-holding employers through the apprenticeship process. Back to the survey, only two countries- India and the U.K reported specific mechanisms to identify SME skilling needs. The MSDE stated the Industry Apprenticeship Initiative (IAI) to identify and communicate SME skill needs. However, our own search has not revealed any more information on the IAI. To the question of legal or regulatory reforms, aimed at incentivizing apprenticeships in SMEs, the MSDE pointed to industry-friendly changes to the Apprentice Act in 2014. Large differences exist in the way apprentices’ working and training conditions are structured. In the absence of specific provisions for apprentices, social security benefits seem to be a measure of whether apprentices are considered regular employees or not, and what is determined directly between employers and workers. All determinants of working and training conditions, except training content, were found to be regulated by law in over 60% of the countries, with wages and leave entitlement the most heavily regulated. In India, wages, leave, training content and working hours are all stipulated by law. The MSDE did not respond to the question on social security. We feel there should be room for collective bargaining in India in determining working and training conditions, especially to allow SMEs to shape training suited to their individual needs which a more generalised law may not be able to accommodate or address. Overall, it was found that countries tend to have legal provisions for the employment of apprentices rather than for the actual training delivered. We feel this is definitely an area that calls for improvement as the legal premises under which training takes place will go the distance to ensure consistency and quality of training. In Part II we look at key findings and good practice on the remaining 5 Action Points.